When I first arrived at Artisan 57 for my complimentary skin consultation, I was very excited to learn more about my skin and have a skincare regimen created specifically for me. I went into the consult thinking I would leave with just a list of skin care products, but I walked out with so much more! Through pictures on the FotoFinder and Visia, and a conversation about my skin concerns and goals, the wonderful ladies at Artisan 57 crafted the perfect plan for me, my skin, and my wallet! I have now switched my whole skincare routine with products and tools from their lineup of medical grade skincare. This was the first step in my journey to loving my skin. I slowly built up my “collection”, product by product, so I didn’t feel overwhelmed and neither did my skin! Not only did the artisans suggest which products would work for me, they also coached me through the reasons they were chosen for me. 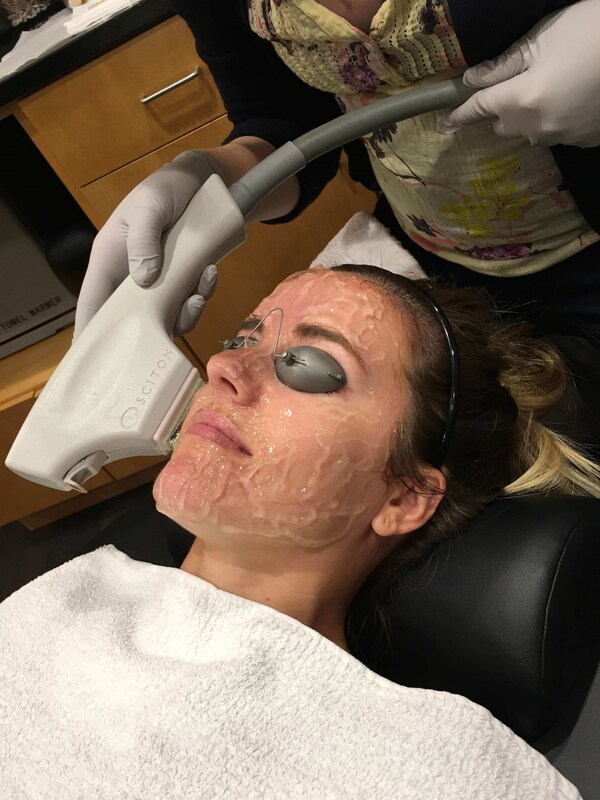 Through one-on-one education, and through some fun group luncheons they have hosted, I now have a better knowledge of what goes on my skin and feel confident about those choices. The next step in my journey was a treatment. My biggest concern was the reds in my skin and I knew I didn’t want something that involved a lot of downtime. I also wanted something preventative to keep my skin looking younger longer. The artisans recommended I try a BroadBand Light (BBL) treatment. This procedure has no downtime and can be customized to target reds (it also can target browns and acne). I chose the “Forever Young BBL” which adds passes of SkinTyte, a type of BBL that stimulates collagen and tightens the skin. The treatment was also very affordable, and can be purchased in a package for a better deal. I was sold and made my appointment. My BBL was quick and easy! Upon arrival, I cleansed my face and then reclined in a comfy chair with a warm blanket. Gel was applied to my face before beginning the treatment and then the PA, Alyssa, began with the BBL procedure. The handpiece applied bursts of light to small, concentrated sections of my face. There was a slight warmth and vibration with each application - no pain! She did two passes over my skin and we were finished. I did the procedure over my lunch, and was able to go back to work right away - and I even put on makeup after. There was absolutely no downtime, and after a few days I started noticing a difference in my skin. Soon, I was going foundation-free since I didn’t have any reds to cover up! I have the best skin of my life, thanks to Artisan 57!